The Mangalitza breed originates from the former Austro-Hungarian Empire, so it is a European breed and part of the domestic pig breeds. The breed came close to extinction in 1980’s with only around 250 Mangalitzas remaining. However, with active measures taken, the breed was revived in Hungary and has since made its way to many other countries, such as Finland, the United Kingdom and the US. 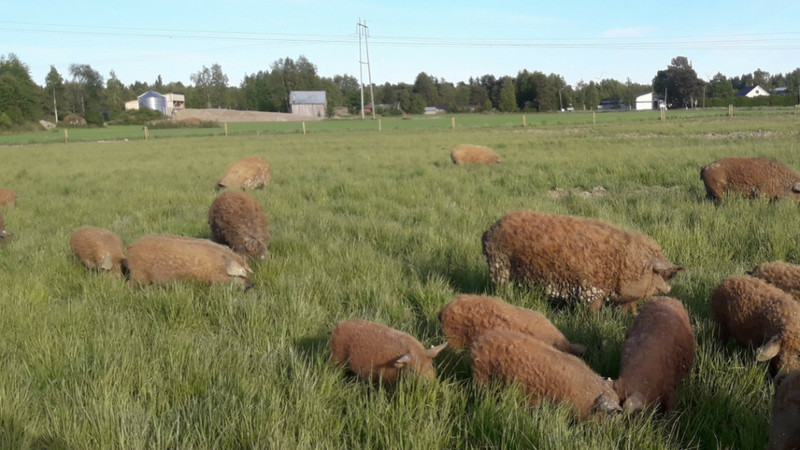 Now, in 2018, you can find tens of Mangalitza breeders across Finland. The Mangalitza is considered a fatty pig type, in other words, its meat contains more fat than, for example, the meat of the more traditionally bred pig breeds. Unlike the more traditionally bred pigs, which have a fat layer around 30mm thick, the Mangalitza’s fat layer can grow as thick as 100mm. This fat layer is why the breed is perfectly suited to being bred outdoors. It protects the animal from the cold winters as well as the summer heat. The Mangalitza is bred on pastures. The animals have plenty of space to act out their natural behaviours, such as digging. On large pastures the animals also have space to give way to each other. This is important as the drove often includes animals of different ages. The pastured animals have a shelter available to them to protect them from the winter winds and roasting summer temperatures. 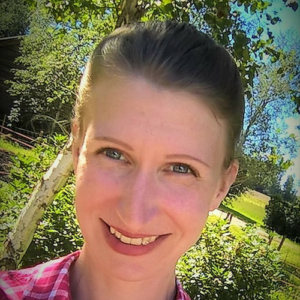 On our farm we have three pastures for our animals and we switch between these annually. When an area isn’t being used as a pasture, it is utilised to grow crops. This way we make use of the feces left behind by the animals as a fertiliser. Our aim is to ensure as ecological a way of production as possible. The meat of the Mangalitza is fattier than the more traditionally produced pork. However, the consistency of the fat is more tender, marbling beautifully between the muscle fibres. The marbling is also affected by the age of the animal. On our farm we breed all of our animals to at least 18 months of age. The animal’s diet affects the taste and consistency of the meat. We use oats, peas and rye draff to feed our animals. The oats and peas are mainly sourced from our own farm and the rye draff is provided to us by Kyrö Distillery. We want to guarantee a good life to are animals, from the beginning to the end. The piglets are born on our own farm and stay together with their sow until they are 8 weeks old. After that they are moved to the pasture, where they are bred until they are at least 18 months. 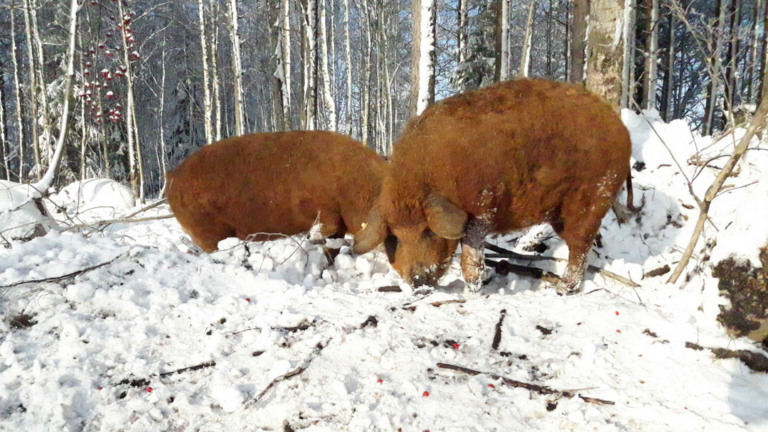 We work in partnership with Tajma slaughterhouse located in Pedersöre, about and hour’s drive away from the farm. The animals always have a day-long resting period after the transportation, and the slaughter is done by appropriately trained staff. The meat is packed and frozen instantly after cutting to maintain the highest possible hygiene standards.